The pound fell after the Bank of England's latest forecasts gave few signs of an early interest rate rise. The Bank upgraded its growth forecast for this year to 2%, and - as expected - kept interest rates on hold at 0.25%. It said some of its rate-setters had "moved a little closer" to their limits of tolerating inflation overshooting the Bank's 2% target. However, markets felt there was no real change to the Bank's stance, and the pound fell sharply. Against the dollar, sterling fell by 0.8% to $1.2562, while it dropped about 1 euro cents, or 1.0%, against the euro to 1.1639 euros. The fall in the pound triggered a rise in the benchmark FTSE 100 share index, which closed up 33 points at 7,140.75. 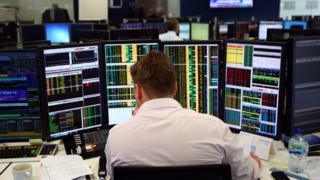 A weaker sterling is seen as beneficial to many multinational firms listed on the FTSE 100, as it means earnings overseas are worth more when converted back into pounds. Among individual shares, Reckitt Benckiser rose nearly 4% after the consumer goods group confirmed it had made a bid approach for US baby formula maker Mead Johnson. Reckitt has made a $90-a-share cash offer for Mead Johnson, valuing it at $16.7bn. Shares in Royal Dutch Shell were up by about 1.3% after the oil giant reported its latest results. Profits for 2016 fell to $3.5bn from $3.8bn. However, Shell said cash inflow during the final quarter of last year had been $9bn, more than covering its dividend, and that it had been able to repay $4.5bn worth of debt. Vodafone shares were flat after the mobile phone giant said growth in full-year earnings was set to be at the low end of its range of 3% to 6%. In the final three months of 2016, Vodafone said its UK revenues had fallen, citing tougher price competition in its business services division.